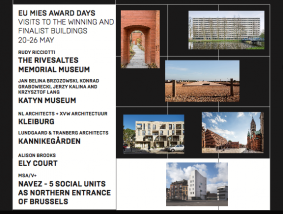 During the week previous to the Award Ceremony, the buildings of the EU Mies Award Winner (Kleiburg, Amsterdam), the Emerging Architect Winner (Navez), the 4 Finalist works (Rivesaltes Memorial Museum, Katyn Museum in Warsaw, Kannikegarden in Ribe and Ely Court in London) will organize events to explain the architecture of these places in situ. Downloading for free the EUMiesAward mobile app everyone can view all the works nominated in this year’s edition of the Award in their mobile phone and find out exactly where they are and how to get there. In addition to the works nominated for the 2017 edition, the cities of Berlin, London, Dublin, Paris and Barcelona have included all the works nominated in every edition. Next updates will incorporate works to complete previous and future editions to provide a panorama of European Architecture since 1988. The Architecture Days will conclude with the Mies Talks and the Award Ceremony that will take place in Barcelona on May 26. DeFlat Kleiburg: Saturday 20 ‘open day’ from 11:00 to 15:00. Architects and the consortium/initiators, will be giving guided tours in and around the building every half hour. Reservations at mies@nlarchitects.nl.